and the so-called “complete [but wildly inconsistent] survey” of the paintings in vol. VI of A corpus of Rembrandt paintings ($1499 in hardcover, $109 in softcover – huh?? – with W numbers, for Wetering, Ernst van de. I wouldn’t call the post-B catalogues apocryphal, but they no longer fill the function of a Bible. This may be an accurate reflection of our ongoing uncertainties with regard to so much about Rembrandt, but it means that we no longer have handy, standard editions of the work of Rembrandt to make clear to each other which objects we’re talking about. Taschen Publishers are rumored to be bringing out complete new catalogues by top specialists of all his work next year, in the Rembrandt year marking 350 years since his death. That would (could – we’ll see) be a blessing. Then there are the bibles of Rembrandt documentation. In 1906, Rembrandt’s reported 300th birthday (it might however be the 299th or 301st; the indications are contradictory), the all-time giant of Rembrandt scholarship, Cornelis Hofstede de Groot, published Die Urkunden über Rembrandt (1575-1721) (The Rembrandt documents), more than 400 items from archives and published sources. I call him the all-time giant because in the same year Hofstede de Groot also brought out a catalogue of Rembrandt’s drawings, and in 1915 a catalogue of his paintings, which to this day is unrivaled for its information on the ownership of Rembrandt’s paintings. In 1979, the Urkunden was superseded in part (because it only goes up to 1669 and does not have all the information offered in the Urkunden) by Walter Strauss and Marjon van der Meulen’s The Rembrandt documents, with translations into English of documents that to Hofstede de Groot’s audience were perfectly readable in Dutch, German, French, Italian and Latin and did not have to be translated. These venerable books too are being replaced, in a seemingly endless process, by a more ambitious but nonfinito Radboud University-Huygens Institute facility called Remdoc. These quotations were reprinted, in the same sequence, by Hofstede de Groot in 1906 and Strauss and van der Meulen in 1979. That is unfortunate, because the link between those two remarks is misleading. In the actual manuscript, the relevant page of which I illustrate here, with thanks to the Utrecht University library, Buchelius writes first that the rector gave him “his portrait,” and only after three other snippets does he make his dismissive comment about the (terrific, if you ask me) painter and etcher Esaias van de Velde, who in 1628 was living in Haarlem, not The Hague. See the paragraph from the third line on, until the ink grows lighter. 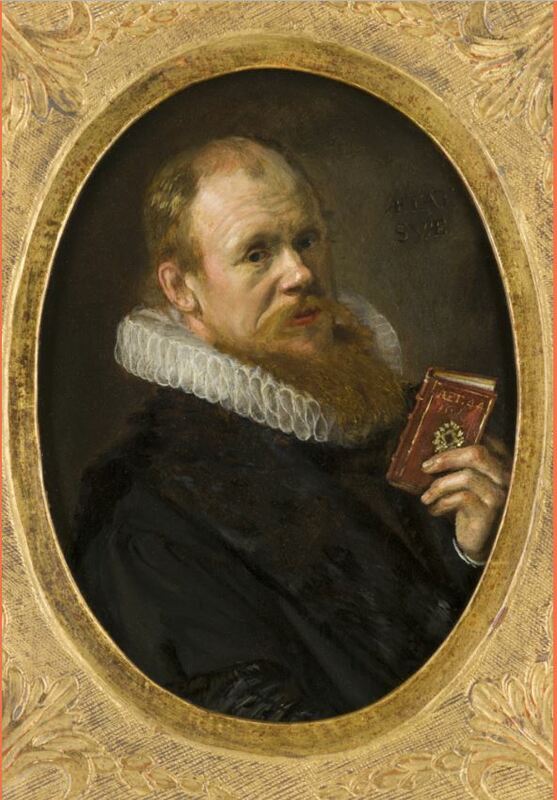 When the Utrecht advocaat and art lover […] Arnoldus Buchelius (Aernout van Buchell, 1565-1641), came to Leiden in 1628, he visited the rector of the Latin school in that city, the art collector Theodorus Schrevelius, and the two talked about art and artists. Van Buchel made notes of this discussion which he later filed away between the sheets of his Res Pictoriae, his notes on the art of painting. One of these notes concerned the painter Esayas van de Velde, to which Van Buchel added: ‘the rector Screvelius showed me his [Van de Velde’s] portrait very lifelike on a panel by the Haarlem painter Frans Hals’. This vignette illustrates the way, in the communication between art lovers, the portrait of an artist could function; if there was an opportunity to show a portrait of the artist under discussion, the chance would apparently not be passed up. The small scene involving Buchelius and Schrevelius makes it clear that there was a demand among art lovers for portraits of artists, whoever they were made by. … The role of the collecting art lovers like Van Buchel and Schrevelius must be considered to be one of the most important factors in any explanation of (the greater part of) Rembrandt’s production of self-portraits. Van de Wetering marshals this as powerful evidence that Rembrandt created his self-portraits not out of inner pressure, as many other art historians have assumed, but in answer to the external pressure of the market. It comes as the climax to a long diatribe against Perry Chapman (Rembrandt’s self-portraits: a study in seventeenth-century identity, 1990) and anyone who agrees with her that Rembrandt’s self-portraits have an important self-examinatory dimension. Although all of us rely on Hofstede de Groot and Strauss and van der Meulen, van de Wetering should have been on his guard before going as far as he did – in a polemic, no less. 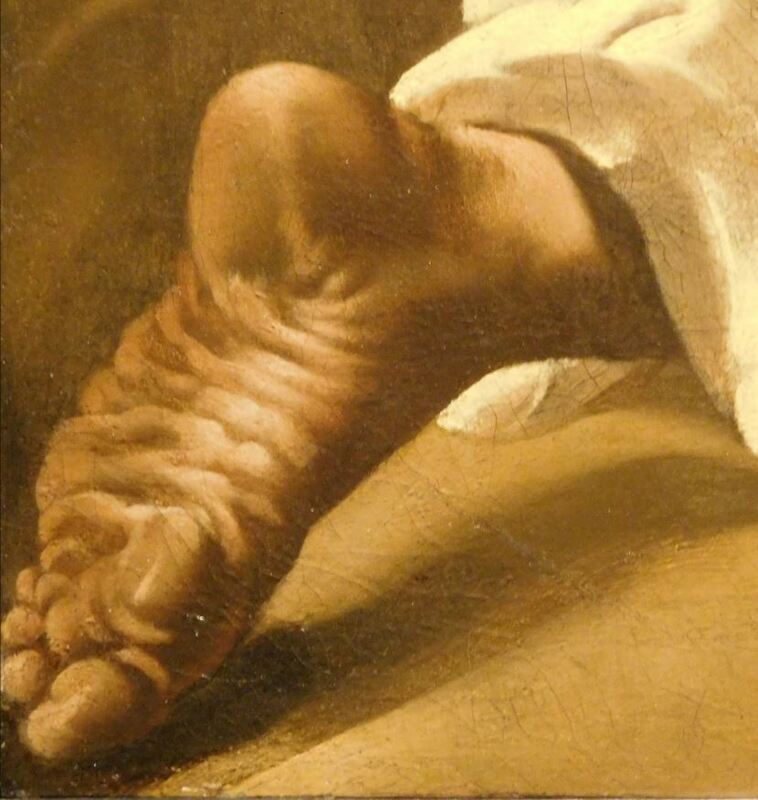 His bracketed insertion “the rector Screvelius showed me his [Van de Velde’s] portrait … by Frans Hals” is speculative in itself and soars past the simple fact that no portrait of Esaias van de Velde by Frans Hals – or by anyone else, for that matter – has ever been recorded. 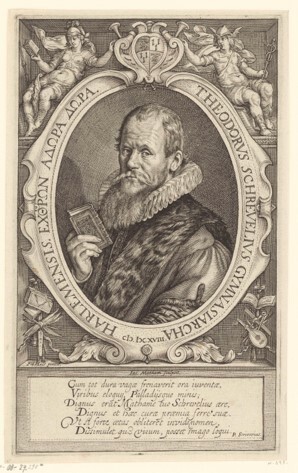 On the other hand, there is a very nice Frans Hals portrait of Theodorus Schrevelius, which was moreover engraved in 1617 in an engraving by Jacob Matham, as a superior calling card. 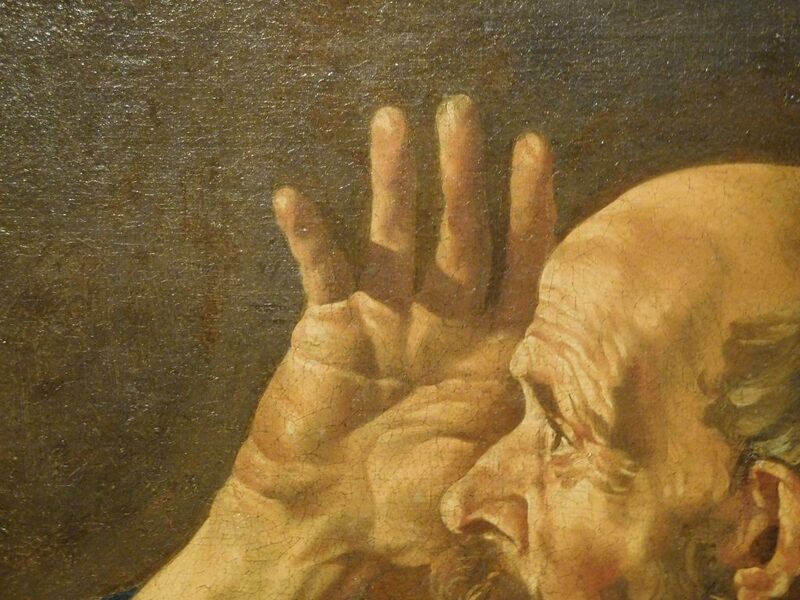 This matches to a tee Schrevelius’s linking in the same sentence of “his portrait” by Frans Hals to that of Petrus Scriverius by the same master. Can there be any doubt that the portrait by Frans Hals that Schrevelius showed to his friend from Utrecht was not of the frivolous Esaias van de Velde, but of himself, that it was the above painting (left) and prints (below) they were looking at? Van de Wetering is not the kind of scholar to rush to Utrecht to check a piece of evidence like this. He doesn’t have to be. However, he could have gone so far as to consult the edition of Buchelius’s notes on art published in 1928 by G.J. Hoogewerff and J.Q. 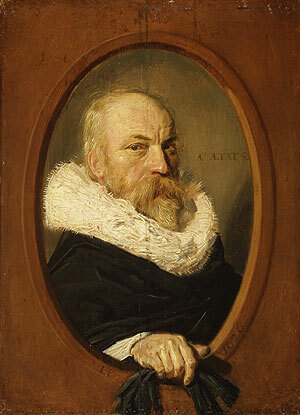 van Regteren Altena, who transcribed the relevant document correctly. With this vital element in van de Wetering’s argument disallowed, I submit that discussion of Rembrandt’s motives for making self-portraits should resume, more open-mindedly than in the Corpus. © 2018 Gary Schwartz. 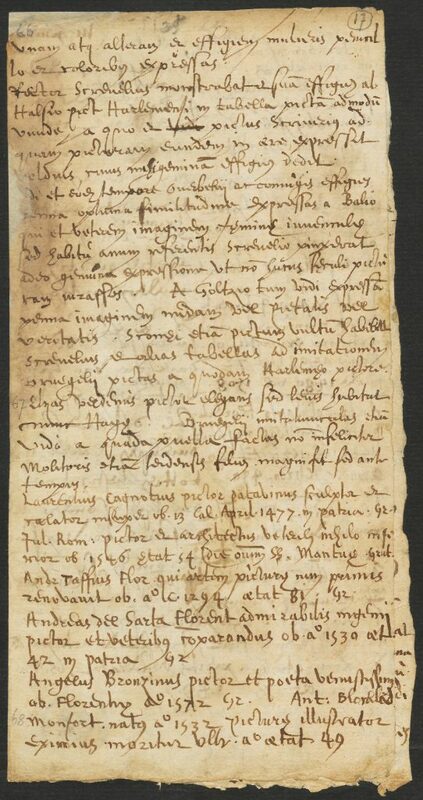 Published on the Schwartzlist on 14 September 2018. The substance of this column comes from a class that I gave at the School for Continuing Education at Zürich University in the course Die Sprache der Kunst, The Language of Art. I treated them to a detailed, technical discussion of this issue, on the grounds that it has much to do with Rembrandt and the word. I will be forwarding this column to the indomitable course leader, Bernd Roeck, and his wonderfully capable administrator Janina Gruhner, for their dedicated students. With a day to spare in Zürich, Loekie and I spent a rewarding afternoon in the Kunsthaus. We were struck by the many donations of Dutch paintings by the Koetsers. Here is a Dutch family art dealership in Switzerland that plays a big role on the Zürich museum scene and who knows where else? I always visit the Koetser stand at TEFAF, and was hoping to go to the gallery itself. I was disappointed that it was not behind a welcoming ground-floor storefront with great paintings in the window, but on an upper story in an office building where moreover no one answered the doorbell or telephone. Here are two details of crustaceous body parts from a Liberation of St. Peter by Matthias Stom, 1632, donated in 1986 by the Betty and David Koetser Foundation. 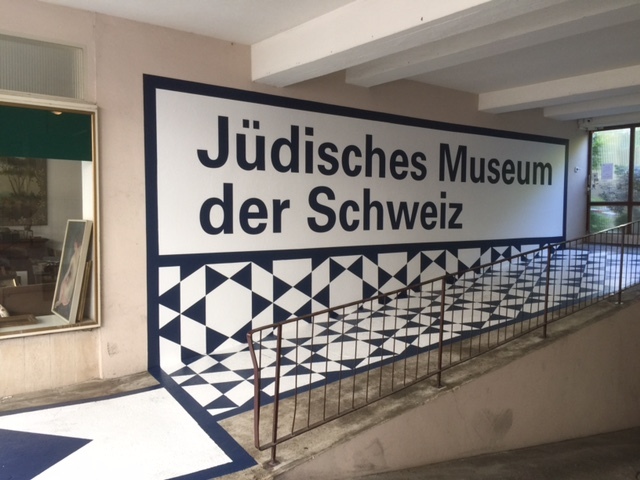 Another closed door met me when I found my way to the grandiloquently named Jüdisches Museum der Schweiz. Arriving at 2 minutes past 4 at a distressing entrance inside a parking garage, I saw that the museum closed at 4 and was open only from 1 to 4. Something is wrong there. I don’t know if I have mentioned it before, but this month Loekie and I are celebrating our second 50th wedding anniversary. The first was on 26 April 2018, fifty years after our civil marriage in Brooklyn Borough Hall. Above a photo taken at the garden party given by my mother Renee for us in Far Rockaway. Our second wedding, under the chupah, took place in Manhattan in September 1968. In April this year we were too exhausted to do anything, but this Sunday, 16 September, we’re throwing a proper golden anniversary party in our own garden. Responses in the Reply box below (these will be viewed by all visitors to the site), or personally to Gary.Schwartz@xs4all.nl are always appreciated and will be answered. Many congratulations to you and Loekie on your 50th anniversary. 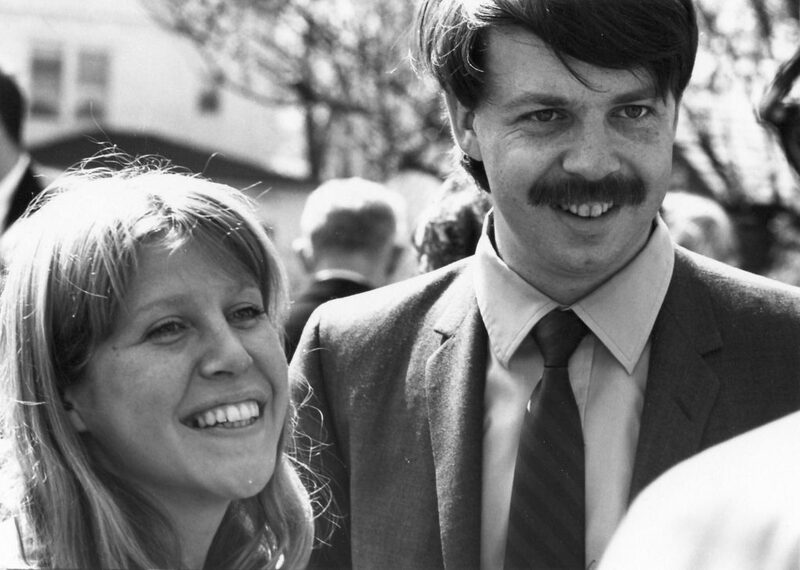 The photo of the Far Rockaway party looks like Clark Gable just married Julie Christie. Thanks also for the nice mention of my website. Many thanks, Martin. I looked up Julie Christie and found that she was born two weeks after Loekie. It must be in the stars. Modesty prevents my commenting on whatever resemblance I ever had to Clark Gable, while honesty dictates that I admit you are not the first one to have paid me this compliment. A number of Rembrandt’s self-portraits were I believe planted in high places. During his lifetime, there were self-portraits by him in the collections not only of Charles I, but also Louis XIV, Emperor Karl VI, the grand dukes of Tuscany and perhaps one or two German courts, where they show up later. All kinds of motives were involved, including the commodification of the self-portrait that Ernst van de Wetering believes in. But that does not exclude other aspects of this fascinating phenomenon that he categorically excludes. I enjoyed reading your column. From first hand experience I learned that rechecking your sources can yield unexpected new insights. However, I do tend to share Martin’s view on the self-portraits. One view does not exclude the other. So far, I still do not have a firm grip myself on understanding what Rembrandt was doing there. Anyway, I also wanted to comment on your remark on the New Hollstein Rembrandt. Yes, the series is expensive, and thus also the Rembrandt volumes are. We certainly did get response on our decision to abandon Bartsch’s order. This makes finding a print in our catalogue more difficult, because it is not ordered thematically any more. We did anticipate that problem and included no less than three concordances, at the end of volume 2 (also indicated in the table of contents of that volume). One on Bartsch number, one on Hind number and one on NHD number. Each refers to the standard catalogues, including Münz and Biörklund. Furthermore, at the end of volume 7 there is an index on printmaker, which can come in handy for the copyists. If one is used to Bartsch’s order, this may not be to one’s taste, but I believe the present order does give a good stylistic overview of Rembrandt’s development as an etcher. And finally, congratulations to you and Loekie on your 50th anniversary. Many thanks for your polite correction, Erik. I apologize for my own slip in saying that the New Hollstein Rembrandt volumes lack a concordance to Bartsch numbers. If the Schwartzlist were the New York Times, I would make the correction in the text and add a note at the end. However, I am letting it stand as is, as an object lesson to myself. Thanks too for giving me the opportunity to say how excellent your and Jaco’s catalogue is. Not only do you include the holdings of far more print rooms than have been included previously, and not only have you discovered so many undescribed states, but you have taken a quantum leap in the cataloguing of old master prints, with attention to many more aspects of the prints than are traditionally dealt with. Since no one commented on the issue of Rembrandt’s self-portraiture during his lifetime, much less himself, there is room for endless speculation. The question is, can art history/theory alone account for a phenomenon as complex as art? There are many reasons to paint a self-portrait, not just one, but several at the same time, and the experience of self-portrayal surely goes deeper than purely esthetic or commercial considerations, especially in the hands and eyes of a recognized genius. Maybe Rembrandt had a strong ego, or a very weak one. Maybe Rembrandt had a good sense for marketing, because it worked. Maybe he just got lucky in giving his face to art. Isn’t it strange that what began as a team project, the RRP, ended up in the hands of one man? And isn’t it telling that the first volume he brought out was devoted to the self-portraits? There are many reasons why people make a bid for fame. The self is a strange attractor. Next Next post: Can the Prado be reformed before its pictures disintegrate?